A mass of fans may have deserted Andrew Flintoff's men after their first Test defeat in Brisbane. But one good contest and they'll all be back. Diary of an Ashes Insomniac resumes tomorrow. Australia reaffirmed their dominance by quickly dashing any hopes of a batting miracle this morning, leaving England with very little to take from this game into Friday’s crucial second test. Now if this Ashes series is to really take off, England have to win in Adelaide. The result is even more significant than the first test. And England might find that the sense of occasion – though immense – will be less fraught then it was in Brisbane. It’s a familiar situation for England and they know what needs to be done. The question is whether Flintoff can convince his men that they can do it; that they are capable of formulating a strategy that will press the Australians, and ultimately force a win in Adelaide. As a guide to the psychological feeling England should be adopting here, let’s be introspective for a moment. I know how much I care about the England performance. I dream, analyse and despair over each ball in every test. So, look at yourself honestly. Do you believe England can come back? I know I do, and here’s how. 1. Pick Panesar. It’s attractive to delude yourself into thinking that the mighty Monty would have made all the difference at Brisbane. He wouldn’t have. But he gives England control and an attacking option during those long Kookaburra 20-80 ‘middle’ overs. Anderson, though bowling well at times, was too inconsistent for a batting line-up of Australia’s stature. Monty should replace him at 11. 2. Win the toss. You could argue that one shouldn’t plan for things that are out of our control, but Harmy’s radar is beyond anyone’s control and yet we still plan around that. 3. Needless to say it, but bat, bat and bat. This means that Strauss will actually have to play himself in before trying to clear the world’s biggest boundaries with his almighty hook. 4. Open the bowling with Freddie. I have banged on about this for the last three days. Give your strongest bowlers the best possible chance with the new ball. 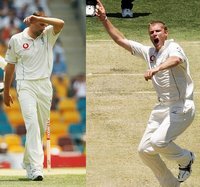 It is for the same reasons that Australia prefers McGrath over Hussey with the new ball. 5. Think 2005 not 95. England are Ashes winners. They are a bunch of aggressive, gifted and tough players who thrive on playing attacking cricket. Through much of this test, England’s body language in the field was meek, lethargic and purposeless. On flat pitches, fielding sides have to work doubly hard to create pressure. This means disciplined fast bowling with occasional short balls that reach neck height, not regular waist-high long-hops. 6. Play on the opponent’s pressure. Australia had a 100-day countdown to this series. They have been subjected to boot camps and at Brisbane resorted to dispersing the Barmy Army around the ground and sending their trumpeter packing. They are obsessed. Their desire is feverish. Ponting almost threw a Trent Bridge-esque fit when dismissed for 196 and when Stuart Clark dropped Pietersen on the third day, he received withering glares and was ignored by his teammates. Australia has put themselves under huge pressure to reclaim the urn. If England could sustain a period of dominance and scare them; the Australian players, media and supporters have the potential to explode. 7. And finally, the elephant in the room, Stephen James Harmison. It is unfair of us to project our dreams on to him, but many have. He has to play at Adelaide, but must not become the distraction he did at Brisbane. If he’s not firing, use him as a middle over stock bowler. Set the field back and let him toil away for few runs. In Brisbane England wasted time and energy trying to get him right. Sky Sports spent more than two days demonstrating their split screen analysis of his bowling action. Every paper has put in their two-cents worth. It’s all a distraction. For now he should accept Dennis Lillee’s offer for a few coaching sessions. Lillee is the finest fast bowling coach in the world and a mentor to Troy Cooley, the coach who took England to Ashes success before switching sides. Now that nothing is expected of him, Harmison may roar in and win England the Second Test. But if he doesn´t, lets not spend five days talking about it. The first test has been the worst of starts for England, yet they and the Aussies know that this series is far from over. Bring on round two. After 261.1 overs, two declarations and three abysmal days, England finally turned up to Brisbane and injected fire into the Ashes. Of course, it’s all a little too late, but the performance dragged some much-needed momentum back into England’s Ashes campaign. It has exposed some of the weaknesses of the home side that the visitor's shoddy performance has so far masked so effectively. More surprisingly, it has left England with the most miniscule of chances to pull off a draw. 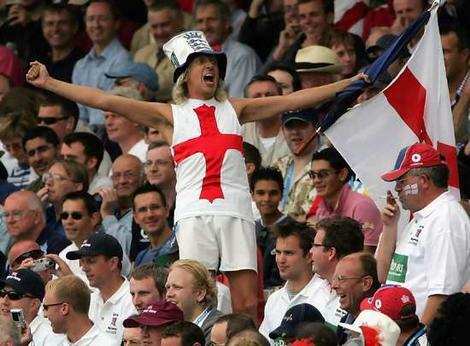 It’s a strange and unnerving thing being a die-hard England fan. Like a twisted form of love, you can be mistreated, uncared for, utterly dismayed and angry for three days, but when offered the smallest signs of care, all is forgiven. Almost without realising it, the acceptance of defeat morphs seamlessly into blind optimism again. The farce of Australia’s imposed second innings ended with Justin Langer reaching a meaningless century and Ricky Ponting sustaining a back injury. This gave England the impossible task of batting five-and-a-half sessions in an attempt to spare being ridiculed all the way to Adelaide. It was a task that would require patience, composure, skill and the smallest of miracles. The opening scenes were familiar. Andrew Strauss, for the second time in the match offered little, hooking needlessly down deep to square leg early in the innings for just 11. When Warne dismissed Bell with a slider a duck, England seemed to capitulate. Collingwood also started off unconvincingly, stuck on the crease as if waiting to be dismissed, before the welcome lunch break. Whatever talks took place over England’s lunch table had been badly missing two days ago. England took the field looking positive, determined and crucially decisive. Cook battled hard, before being caught at short leg via the inside edge off Warne, and would have learned much from his 43. Pietersen then enjoyed the first classic contest of the series with his pal Shane Warne. After playing himself in with maturity he took the game to the Australians, using his feet well and flicking him through mid wicket before unleashing his trademark slog sweeps. Together with Collingwood, the pair dominated Australia in a determined 153-run stand. Suddenly with Ponting unable to take the field with his dodgy back and McGrath showing his age with a bruised heel, Australia may have exposed some seeds of doubt. England were finally able to punish them with an authority that has been badly missing since 2005. Just as he always does though, Warne struck the decisive blow towards the end of the day. Collingwood had played calmly and superbly, but with barely 15 overs left of the day, fell victim to Warne’s trickery, waltzing down the pitch and getting stumped on 96. Flintoff then got to the wicket, stroked a couple of commanding boundaries before mistiming a pull from a Warne long hop and skying it to mid on. It was a cruel blow after such a convincing performance, only firing another nail into England’s coffin. Australia has been in complete control of this game, but it was vital that England clawed some self-confidence back with a good performance. Tomorrow Pietersen and Jones will need to apply themselves and continue much in the same vain as today, steering the game well into the afternoon at least. And whisper it quietly, but there is mention of rain late tomorrow. These are dark days for England. Yesterday they made good bowling look great, and a dodgy pitch look a minefield. Predictably, they were skittled out for 157. But what followed was less predictable, though far more damaging. 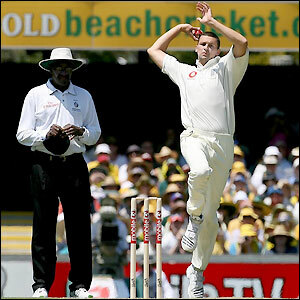 Ricky Ponting as if he was somehow bemused by the lack of contest, threw England a lifeline. Not for the match, which was over, but for the series. Before that what we desperately needed was an opportunity to regain ground in the mental war. We needed something positive to take into the rest of the series. Just as how despite being thrashed at Lords in 2005, England showed they could take learning into the rest of the series. And Ponting threw down that gauntlet. He gifted England an opportunity to run in and redeem their shoddy display of the first day. To prove to everyone that it is England who has the more potent fast bowling unit. Prove that day one was just nerves. Prove that they can come back strongly in this series, just as they did in the last. It was an extraordinary piece of generosity. It looked like Buchanan and Ponting had conjured up one trick too many for this game – one that could come back to haunt them. They offered England a much-needed turning point in the series. Flintoff should have roused his men, urging them to fire, aim to take down five wickets for 100 and leave Ponting declaring again in the match, but this time limply and under a barrage of questions. It is not easy to lift yourself after such an abysmal batting display but Flintoff and England were given that chance. Instead we were subjected to the worst display by an England side for years. Anderson was tossed the new ball as an uninterested and despondent England shrugged around the field with little purpose, almost waiting for Ponting to put them out of their misery. There was little noise from England, no fight; this was a side that showed remarkable disbelief in their ability to compete. Flintoff has to take some responsibility for this. His leadership credentials are based on his ability to inspire and instil belief in his players. He failed to do that, and failed to take charge with the new ball. Given the opportunity to begin the fight back now, instead of at Adelaide, England seemed curiously limp of any desire. For followers of England it was the most desperately disappointing passage of play, matching anything from the dark ages of the 1990’s. It cannot be stressed enough that test matches, and Ashes cricket in particular, is a psychological game. It’s very rare in this game that you’re thrown a lifeline from the brink of defeat. If England can’t regain the desire to compete in this series, there’s a flight leaving from Brisbane tonight. If you ever needed proof that much of test cricket is played in the head, look no further than England’s two strike bowlers. Flintoff and Harmison have all the potential to be world-beating quicks. Both have abilities to make a decisive impact on this series. But while Flintoff is revelling in carrying his side, Harmison is struggling with himself. So much of Ashes cricket is about stamping authority on the opponents, thriving on the contest and dealing with confrontation. Harmison’s struggles are continued fuel for debate but it has been clear all tour that he is desperately low on confidence. Flintoff meanwhile is a different being. His strength of mind shows in the way he charged-in to Australia's batsman all day. Questions of confidence have never entered the equation. Yet Flintoff has bowled far less in the last six months than his Durham peer. Looking back on this test match – which is all but decided now – many will cite that infamous first ball on Thursday. If the statement had to be made in that first over of the series, surely Flintoff was the man to do so. To play on a ground where Australia have always been dominant, and to take it upon himself to launch the Ashes would have been the best way for England - and Flintoff - to stamp authority on this series. Instead they opted for somone desperately short of match practise and vulnerable to gremlins when the chips are down. It was a horrendous error of judgement that exposes the muddled thinking among England’s backroom staff. While we were driven to distraction about England's potential lower order batting woes, there has been failure to recognise that with so many bowlers coming back from injuries and lengthy layoffs, it is not the batting that needs propping up, it is the bowling. What are these extra 30 runs that Giles is capable of providing down the order worth, when the opposition has amassed 602-9 declared? Giles toiled away admirably, bowling the dependable dross that has lent him a fantastic career. But what would Flintoff have given for the attacking and controlling presence of last summer’s highest wicket taker? Leaving Monty Panesar watching on helplessly from the dressing room, while Pietersen turned the ball is a decision that Fletcher will regret. Hindsight is a curse for decision-makers, but a gift for commentators. Looking ahead, any chance for salvaging a result from this test ended yesterday evening when Strauss ended up pulling thoughtlessly down deep square leg. Now it it is essential for England to regain ground in the psychological battle. Bell must replicate the classy authority he showed this summer against Pakistan in the cauldron of Ashes pressure. Pietersen must show his resolve to stay at the crease long after Australia’s fiery spells of the opening session. Keeping the aging McGrath in the field for two days will do England’s chances no harm for next week’s second test. England must prove to Australia – and perhaps themselves – that they are capable of taking this Ashes challenge head-on and coming out on top. If not for this test, than for the sake of the series. Whatever the state of a game, you are often just a few balls away from turning it on its head. It is this notion that exploits humanity’s most inexplicable emotion - hope - and that which feeds the addiction of a cricket observer. But neither hope, belief nor blind optimism can mask the daunting feeling that England are in a spot of bother here. Let’s be clear, this Brisbane pitch - a ‘good batting pitch’ - is not good for cricket in any sense. It removes all the variation and subtlety from the bowler’s armoury. That is of course, unless you’re one of the best spinners to ever play the game. And this is what will end up separating the sides in Brisbane. Take Warne out of the equation and – on the pitch we saw yesterday – you could imagine Australia’s bowlers may have been equally innocuous. But with Kevin Pietersen finding turn, one can only imagine how much Warne is looking forward to making his mark on this match. As it is, England must find a way to take 20 wickets without seam, swing, reverse swing, or much pace and bounce.